Grading Dates 2019 – Students will receive a notice closer to the dates. Oceanias – Sydney 13-14 April. The team is training hard and looking sharp. Keep up the good work. Stock due in this week for those who ordered White Training T’shirts. We will get them out as soon as they come in. 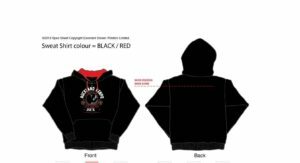 Taking orders now for winter hoodies. The cost is $80 each. There is two styles now available Zip Up or Pullover. We should have a sample of the new Pullover with contrast Red hood next week to view. They must be prepaid and are non refundable so please ensure you are ordering the correct size.